Looks like we are getting a Sonic Forces comic after what seemed like a joke at the town hall earlier this week. Starting today, we'll be getting a 4 part digital comic series leading up to the release of Sonic Forces. Ian Flynn is also writing it! It's also free! Today, SEGA® released the first chapter of a new Sonic the Hedgehog™ digital comic series that is based on the highly-anticipated video game, Sonic Forces™. The four-part comic series is scripted by fan-favorite writer, Ian Flynn, and serves as a prequel to the video game counterpart. 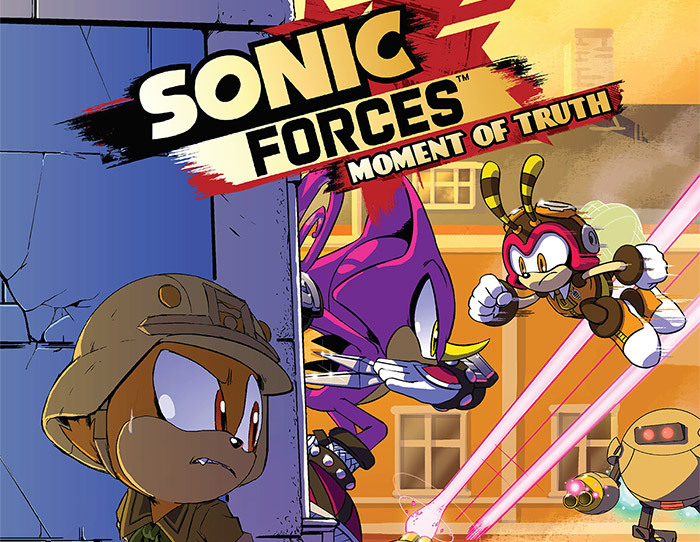 Chapter 1 titled “Moment of Truth” features Sonic Forces’ Custom Hero Character and the Chaotix as they prepare for battle against Dr. Eggman’s sinister robot army. Chapter 2 should be released later this month. When you don't like the tools that's there, what do you do? As revealed by GameHut on YouTube, Director of Traveller's Tales for 29 years, we're treated to how levels were contrued using the game's built in editor. It's likely you're only able to use this in a beta version of the game. Materia Collective is thrilled to release Sonic BeATS, a collection of music by artist Funk Fiction written for the highly-regarded Sonic: Before the Sequel and Sonic: After the Sequel tribute games. Just in time to celebrate the18th birthday of the SEGA Dreamcast (released 9/9/99) and the classic Sonic the Hedgehog renaissance ushered in by Sonic Mania, the time was right to get these amazingly funky electronic pop soundtracks into the hands of fans for the first time. Sonic BeATS is now available. The Sonic BTS and ATS soundtracks are widely praised as being one of the best parts of the games, with Sonic series composer Jun Senoue himself decreeing the albums as "excellent work" filled with "lots of catchy tracks." Funk Fiction states his favorite game in the Sonic series "has always been Sonic the Hedgehog 3," as he feels it "pushed the envelope with one foot in the familiar Sonic sound established in the first two games and another foot in the uncharted territory of complex yet catchy Michael Jackson vibes." "In the same philosophy of evolution from the first two Sonic games towards the third, I wanted to apply the same maturation for Sonic BTS and ATS," comments Funk Fiction. "This time, integrating external influences such as Yuzo Koshiro's Streets of Rage, the French Touch flavor of early Daft Punk's Homework & Discovery, and the rich, gooey, and supremely funky essence of Jamiroquai. This is the result of what you hear in Sonic BeATS." Sonic: Before the Sequel (2012) and Sonic: After the Sequel (2013) achieved over 300,000 tracked downloads with the soundtracks in particular earning cult status on SoundCloud and YouTube, but the music hasn't been made available for download anywhere until now. This music played a vital role in developing Funk Fiction's musical identity, essentially launching his career. It's with that idea in mind that he and Materia Collective have decided to give Sonic BeATS the official release it deserves, which also features brilliant artwork by Andy Tunstall. IDW hosted a town hall today at the panel and they announced that Ian Flynn will be reprising his role as the writer for IDW's Sonic series. Many people attending asked about if certain characters would return or be featured (including the freedom fighters) to which they were not able to answer and to stay tuned. Sonic Megadrive and the other unreleased Archie Sonic comics will not be released. They weren't able to elaborate. Emphasis was placed more on the future stories they will have and that great story telling is priority. 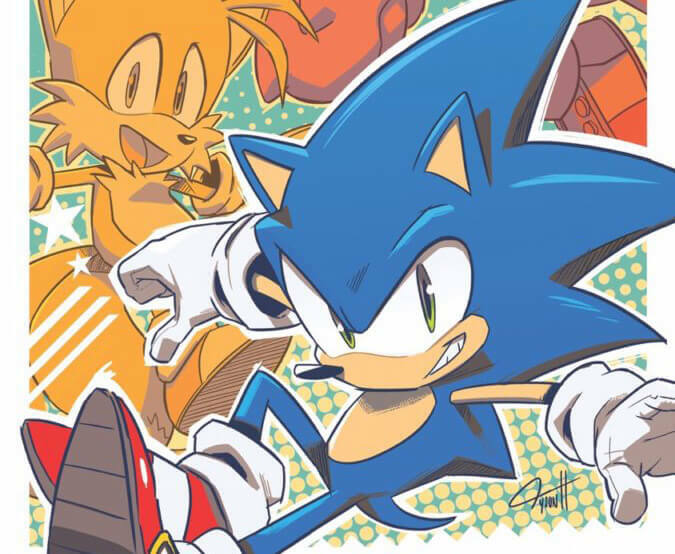 Promotional art done by Tyson Hesse was also shown. Ian Flynn also tweeted, continuing his #knowingsmile saying that more was still to come this week. #KnowingSmile continues. More surprises this week. Stay tuned! And thank you for the overwhelming response! Special thanks to TSSZ for streaming the event! Have a lot of thoughts about this? Please feel free to discuss at our forums! SEGA has published a batch of new information on Sonic Forces that introduces more details to Wispon(the weapon gadget powered by Wisps), which is used by the player-created Avatar. 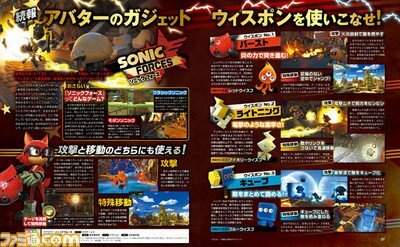 Japanese magazine Famitsu also has a new interview with Sonic Forces producer Shun Nakamura and Sonic series producer Takashi Iizuka, which gives more insight to the game’s storyline and music. The interview has now been translated, click to read the full interview! 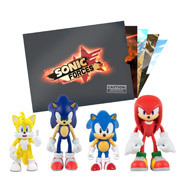 Sonic Forces Action Figure Pack coming soon! Gamestop listed Sonic Forces figures on their online store today, it will be a pack of four figures, featuring Modern Sonic, Tails and Knuckles, as well as Classic Sonic for $24.99. It also comes with 4 lithographs. The release date is listed as November 21st, right before black Friday. These are Tomy's first ever Classic and Modern Sonic action figures. They've been focusing on Boom exclusively since 2014. 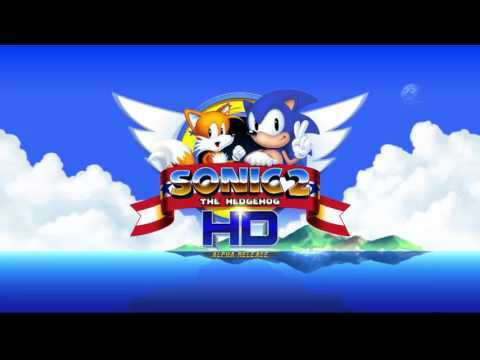 After a long hiatus and a sudden surprise return a new demo for Sonic 2 HD is now available. This demo 2.0 includes playable Emerald Hill Zone, Chemical Plant Zone, and Hill Top Zone. Visit the Sonic 2 HD Website to download and enjoy! It's hard to believe that Sonic Heroes released nearly 14 years ago already. It released to mixed but generally positive reviews(on GC) but how has it aged and what do we think of it in a day that platformers as a genre have not only progressed a lot but also aren't nearly as big as they once were? In a blog post on IDW's site, IDW announced a date and time for their event with Sonic at the New York Comic Con. Attention convention goers, IDW and Sega are bringing the once and only Sonic The Hedgehog to New York Comic Con! Sounds like those who attend will get a little swag as well. It's likely we'll learn the direction for the comic and maybe who'll be at the helm writing it. Ian has been teasingly saying "Knowing smile" on Twitter. Could he be the writer? Hopefully we'll find out Oct 8! Finally, for the first time in months we get a glimpse at a new level in Sonic Forces. Up till now it has been variations of the same two levels. This level combines your typical casino level with a forest-twist!